In addition to wastewater treatment facilities, FuelCell Energy power plants are being successfully used by universities, food and beverage processors-including a brewing company-and the hospitality industry. A Connecticut company-FuelCell Energy-has set up power plants in different locations operating on a variety of fuels, but is currently seeing particular success with wastewater facilities. The combination of fuel cells and wastewater biogas turns out to be a match made in "green" heaven. Fuel cells have been around for decades--in fact, both the Gemini and Apollo space capsules were powered by fuel cell power plants. Today, fuel cells are proving to be a highly reliable way of producing high-quality, ultra-clean onsite power for a variety of industries. Very simply, a fuel cell is an electrochemical device that combines hydrogen fuel and oxygen from the air to produce electricity, and useable heat and water. Unlike a battery, where the chemicals are stored inside, fuel constantly flows into the fuel cell, and electricity flows out of the cell. Since 1969 FuelCell Energy (then called Energy Research Corporation) of Connecticut has been a leader in the development of fuel cell technology. The company was research-based in the 1970s, and from there moved into the commercialization of stationary fuel cell power plants. Today FuelCell Energy offers direct fuel cell (DFC) power plants that range in output from 300 kilowatts (kW) up to 2.4 megawatts (MW), scalable to 50 MW. These compact power plants generate a stable source of energy-operating 24/7-and emit negligible amounts of pollutants. They also offer flexibility. Direct fuel cell power plants operate on a variety of fuels, including methane from biogas, waste gas from industrial processes, and natural gas. "We have had a lot of success in the last few years as the benefits of fuel cells have became understood by different industries," says Joseph Heinzmann, director of business development, western region for FuelCell Energy. "Currently, we are experiencing considerable success in biogas generating industries such as wastewater treatment and food and beverage processing due to the DFC system's ability to use this renewable energy source more efficiently and cleanly than traditional combustion technologies like engines and turbines. "Typically fuel cells can produce nearly twice as many renewable kilowatt hours (kwhrs) as these dirtier technologies and provide a drastic reduction in pollutant emissions," Heinzmann adds. "The extra renewable kwhrs from a fuel cell versus combustion technology is comparable to the amount of renewable kwhrs from a multi-MW photovoltaic system-at a fraction of the cost." The combination of fuel cells and wastewater turns out to be a match made in "green" heaven. The treatment of wastewater involves an anaerobic digestion process, and the anaerobic digesters release methane gas. The gas has been traditionally siphoned off and used to power gas turbines or simply vented into the atmosphere or burned by an onsite flare. Since these methods release significant amounts of pollutants, states like California, where air regulations are stringent, find the process problematic. Fuel cells seem to be an answer. By their nature, wastewater treatment plants are located within the community, providing an even greater need for cleanliness. A perfect example is the Dublin San Ramon wastewater treatment plant in Pleasanton, California, where the facility is located just upwind of the community athletic fields and residential housing. As populations grow and cities expand, wastewater plants are no longer the isolated outpost, and are now in much closer proximity to the community centers. "Direct fuel cells can use a variety of gases to generate electricity, including methane from biogas, waste gas from industrial processes, and natural gas," says Heinzmann. "And because you're using an electrochemical reaction to generate power versus a combustion reaction, it results in negligible emissions of nitrogen oxides (NOx) and sulfur oxides (SOx), and significantly less carbon dioxide (CO2) compared to traditional fossil fuel technologies." In addition, waste heat generated by the fuel cells can be captured and put to good use in combined heat and power (CHP) applications. Wastewater treatment facilities utilize this waste heat to preheat wastewater sludge, helping to optimize the anaerobic digestion process. In addition to wastewater treatment facilities, a wide variety of other industries are using stationary fuel cell power plants for their onsite distributed generation needs. Hospitality Industry: The advantage of operating DFC units for the hospitality industry is efficiency. They normally use natural gas to run fuel cells and FuelCell Energy products produce approximately twice the amount of energy from the same unit of fuel compared to a gas turbine or a diesel engine. The industry can also take advantage of the CHP benefits of fuel cell power plants. For instance, the Sheraton San Diego Hotel and Marina installed a 1.5 MW fuel cell system and the waste heat from the fuel cells is used not only to offset the building's heat and hot water needs, but also to help heat three large swimming pools. The small footprint also allows them to place it in an out-of-the-way location. "At the Sheraton San Diego they actually placed their fuel cells on a tennis court that was seeing little use," says Heinzmann. "These tennis courts are adjacent to the hotel so our equipment's low noise and vibration signature was important." Food and Beverage Processing: Many food and beverage processing facilities generate substantial quantities of biogas that can be used to power direct fuel cell power plants, making the fuel cell a renewable energy source. The Sierra Nevada Brewing Co. has had great success in this area. The company wanted not only an affordable and reliable source of power for its state-of-the-art brewing facility in Chico, California, but also wanted it to be environmentally friendly. They chose to install a 1 MW direct fuel cell installation from FuelCell Energy that uses digester gas generated in the brewing process as a source fuel. They were able to augment the natural gas fuel used to power the fuel cells and provide a clean source of renewable energy. Sierra Nevada was also able to harvest waste heat in the form of steam and use it in the brewing process as well as for other heating needs. The 1 MW installation supplies nearly 100 percent of the company's baseload power requirement and has lowered its overall energy costs, and has helped eliminate air pollutant emissions-equivalent to removing 500 gasoline-powered cars from the road. And if that wasn't enough, Sierra Nevada can send excess electricity back to the grid system and receive credit for a portion of their generation costs. 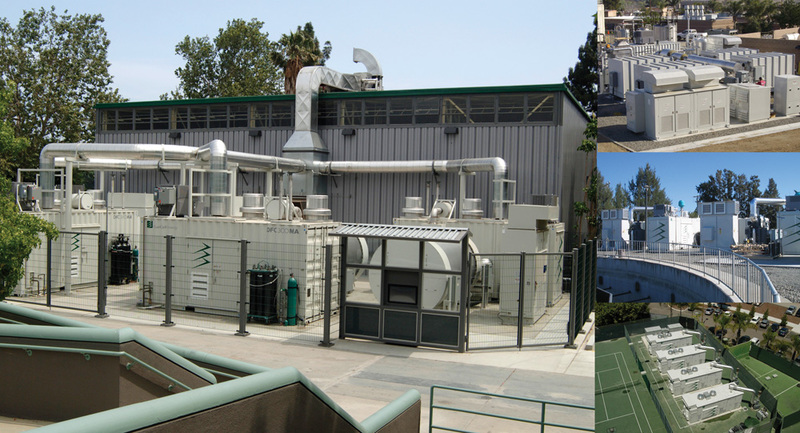 Universities: California State University at Northridge installed three direct fuel cell 300 kW plants that provide approximately 20 percent of total campus power. Interestingly, they located the fuel cell power plants next to the biology department's greenhouses, and even though the fuel cells emit very low amounts of CO2 as compared to traditional fossil fueled generation, the biology department decided to experiment by installing a CO2 capture system to pipe the gas into the greenhouses for plant CO2 enrichment experiments. It worked so well that they are considering it for their upcoming experimental rain forest project. Correctional Facilities: Fuel cells are also flexible in that they work well with other types of power generation. "The Santa Rita Jail in Dublin, California, already had a large, 1.2 MW rooftop solar power system. They were finding, however, that the solar power availability was not in line with their baseload needs. They installed a 1 MW DFC stationary fuel cell system, which perfectly compliments the solar array," says Heinzmann. Fuel cells, by their nature, lend themselves to partnering with different energy companies. FuelCell Energy has a number of strategic partners, including Chevron Energy and The Linde Group/BOC, and they've teamed with utility companies as well. "Our fuel cells have been certified to Rule 21 in California, so they comply with all utility interconnect regulations and streamline the interconnection process," says Heinzmann. "This is a key feature that is becoming more important as the need for power grows and the siting and permitting of conventional power plants takes longer and longer. "For example, a Pacific Gas & Electric (PG&E) 2004 Request for Offer for the Eastshore Powerplant in Hayward, California is still not approved. FuelCell Energy's ultra clean emissions profile and inverter-based interconnection allow speedy regulatory approval, and we're starting to see utilities viewing us as partners rather than competition." One of the reasons for utilities wanting to partner with FuelCell Energy is the ability to easily provide power to remote locations. "As the population grows and moves into remote areas, the costs for utilities to build new transmission networks will be immense. If a utility were to buy a 2.4 MW fuel cell system and place it where the power is most needed they would be saving themselves a lot of headaches." The State of Connecticut has an initiative underway, Project 150, which aims to have 10 percent of all utility- generated electricity within the state provided by renewable methods by 2010. After bids were submitted and different renewable power options reviewed, the state's regulator chose FuelCell Energy power plants to provide approximately 16 MW of power. A completely different kind of partnership is one with Enbridge Gas Distribution. A new technology called DFC-ERG (direct fuel cell-energy recovery generation) combines direct fuel cell technology with a gas expansion turbine to capture the energy normally lost in gas pressure letdown stations with efficiency of up to 56 percent. Natural gas transmission networks utilize long distance pipelines operating at very high pressures, and that pressure is reduced at local utility letdown stations. As pressure is reduced, the gas naturally cools. To prevent the gas systems and pipelines from freezing, the gas must be heated before it flows through the expansion process. Traditionally, the energy available in this letdown process was lost, and gas-fired boilers, which produce local emissions and CO2, provided the heat needed by the process. The DFC, operating on pipeline gas, produces additional electric power. Waste heat from the DFC provides the heat required by the expansion process, replacing fuel used in gas-fired boilers. And the utility grade electric power produced by the DFC system can be used to service onsite power requirements or delivered to the power grid. The result is a self-sufficient and more efficient pressure letdown station. The success of FuelCell Energy's technology, installations, and initiatives, has made onsite, stationary fuel cell power plants a logical choice for many distributed generation applications worldwide. Add to this an increasing demand for more efficient, reliable, and environmentally-friendly power sources, and the day of the fuel cell has truly arrived.